These Portuguese fried pork chops ( costeletas de porco fritas) is one of the most popular dishes in Portuguese cuisine. In a bowl, season the pork chops with the salt, pepper and hot sauce (to taste). Chop up the garlic and bay leaf and add to the bowl. Add the lemon juice to the seasoning and mix all the contents together, cover it, and let marinate for about 2 hours. After 2 hours, heat the olive oil in a frying pan. 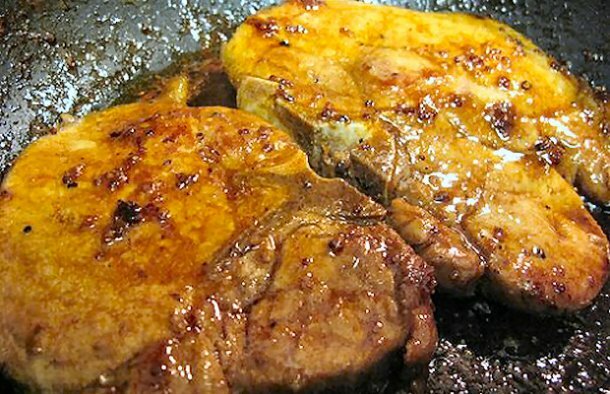 Add the pork chops to the pan and let them brown to a golden color and remove them. Now add the remainding marinade sauce from the bowl to the frying pan with the olive oil, the water and let it continue cooking until well done. NOTE: The sauce from the pan goes great when served with some rice or fried potatoes. 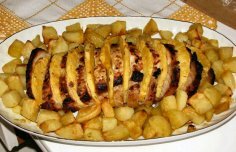 How to make Portuguese roasted pork loin with pineapple. 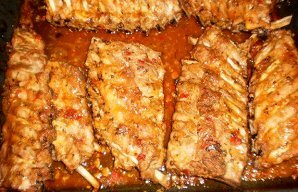 This recipe for Portuguese roasted pork ribs (costeletas de porco assadas) is delicious, serve with white rice or with a salad. 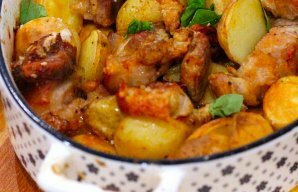 Serve this amazing Portuguese pork and potatoes (porco com batatas) with sauteed cabbage, broccoli or a green salad.